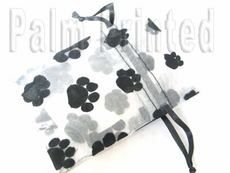 Paw prints organza favor bags. Good for pet favor theme. 4 sizes available. Start from $.50 for each pouch. make sure to click each size to buy it now.